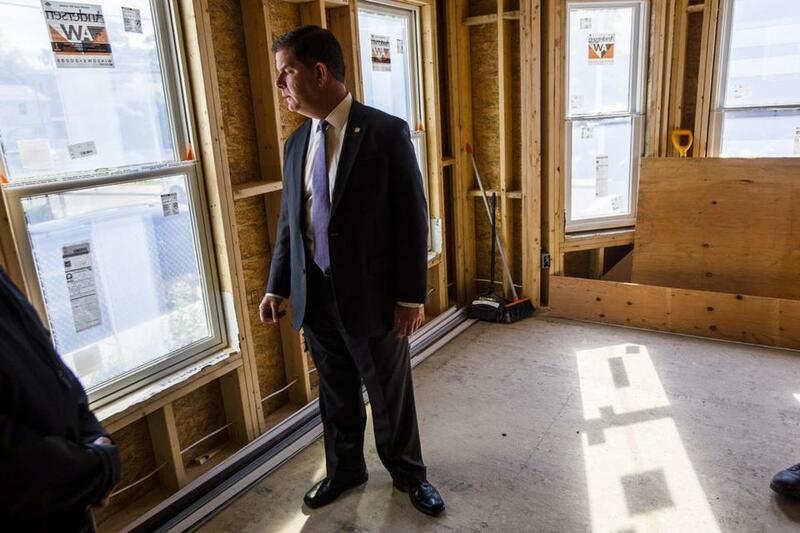 Mayor Marty Walsh walks through a house being renovated for affordable housing. Boston stands at a crossroads — the depth of opportunity or hardship facing future generations depends more than ever on the actions we take right now at the local level. Nationally, we see divisive leadership working to destabilize communities, accelerate inequality, and endanger the environment. At home, as highlighted by the Boston Globe Spotlight Team, we see gaping disparities concentrated by race and zip code. Yet as 2017 draws to a close, I pass on the City Council president’s gavel with renewed hope at the momentum building toward solutions. Over the last term, the Boston City Council has partnered with Mayor Walsh’s administration and community advocates to show that we can be a counterpoint to the paralysis and fearmongering of federal counterparts. Through legislation and our bully pulpit, we are pushing for local solutions to larger issues. We took steps to address economic disparities by race and gender with legislation for equity in opportunity. Our procurement reform ordinance opens doors for women- and minority-owned businesses to have a shot at the nearly $700 million spent each year across city departments on goods and services. The new rules require affirmative outreach to these businesses, evaluation of any bids for city contracts to include ratings of diversity and inclusion plans, as well as quarterly reporting on who is winning public contracts. We also codified the Walsh administration’s proposal to expand the Boston Resident Jobs Policy with increased targets for participation on city construction jobs by people of color and women. We showed that cities can step up where the federal government has retreated, with leadership to fight climate change. From limiting gas leaks to ramping up renewable energy and reducing plastic bag litter, we worked with residents to challenge the status quo and push toward a greener, healthier future. Our legislation has spanned neighborhood quality of life to citywide consumer protection, with ordinances removing barriers for small businesses to host acoustic live entertainment, prohibiting inhumane roadside sales of pets, and discouraging contractors from taking over resident parking. We brought in experts to offer specific recommendations on broad challenges, including transportation, early education and child care, school disciplinary policies, homelessness, and the opioid crisis. In each instance we made stronger policy in partnership with the public, using accessibility and transparency as the starting point. After passing legislation guaranteeing language and communications access so that city services are available to all, regardless of English-language proficiency or communications disability, we applied that policy to our own space. The City Council chamber underwent its first major renovations, for wheelchair-friendly seating and floor access, screens for closed captioning, and acoustic treatments so all can hear the business being discussed. We worked to improve our live-streaming technology and capacity for hosting public meetings in the neighborhoods to reach residents who can’t conveniently come to City Hall. In this upcoming term, the challenge is to turn momentum into bold action on systemic problems, to pursue the nuanced solutions that may not be met with universal support as we shake the status quo. Housing affordability — critical to family, neighborhood, and workforce stability — is out of reach for too many across the city. We must take on forces accelerating displacement, such as short-term rental loopholes, increase opportunities for inclusionary development, and strengthen pathways to homeownership. Quality public education should be the first platform for opportunity, and we need to tackle complicated institutional structures that slow our progress in closing the achievement gap. We must engage families in each school community on the long-term changes needed to stabilize the district’s finances and assure quality across all schools. We must continue to claim transportation as a city issue. Livable streets lead not only to safer neighborhoods, but also greater economic development and more equitable opportunity. Let’s honestly assess the trade-offs for reducing parking or driving lanes to create safe, affordable, and reliable transportation options that move more people on our streets. As we aim for equity and economic mobility, solutions should come from conversations with those most affected. Our voices in local government should empower the most vulnerable and historically marginalized, whether on violence and criminal justice reform, civil rights and workplace protections, or climate justice. What I love most about my City Council colleagues is that our policy conversations are informed by data but driven by real people’s stories and experiences. We must continue to see people of all backgrounds in our work and responsibility. On New Year’s Day, Boston will swear in the most diverse City Council in our city’s history. Whether our representation leads to progress for this diverse city depends on our ability to translate words into action. Please hold us accountable with your stories, your action, and your partnership in 2018 and beyond. Michelle Wu is president of the Boston City Council.